I’ve been a Southern California resident all of my life, yet I have not once driven on the famous CA1 (Sometimes called “Pacific Coast Highway” or “Cabrillo Highway”). My recent move from sunny San Diego to Silicon Valley seemed like the perfect moment to experience the famous highway. I planned the trip to take 2 days and I would drive a rental car with a trunk full of my dearest possessions (basically clothes and my computer). For a semi-leisurely trip, 2 days seems like the minimum (One could accomplish the trip in 1 day if they made no scenic stops, started early, and ate only on-the-go). The CA1 does not actually start until Santa Monica. Thus, I decided that I would visit family at UCLA for the first portion of my trip. I took the usual commuter route (I-15N -> I-91W -> I-405N) and arrived in 3 hours. Unfortunately, I left San Diego around 10AM and got slammed with constant stop-and-go traffic once I reached the LA area. I originally planned to get lunch at Ike’s in Westwood, but could not find parking. Actually, I think that circling Ike’s block took more time than my visit to UCLA itself. Mid-day Westwood traffic is no joke. After circling once, I decided that I would hit the road and find lunch along the way. Getting from Westwood to the CA1 is extremely simple. The I-10W dumps right into the CA1, so I simply took I-405S -> I-10W -> CA1. From there, the surroundings quickly shift from Santa Monica beach city to motels/restaurants to nothing-but-nature. The hotel room I booked for the night was in Cambria, which Wikipedia notes as the midway point for the CA1. Getting there was no problem, albeit a little confusing since CA1 and 101 intermingle. (When in doubt, follow signs for 101N and CA1N, prioritizing those for CA1N). I eventually reached Cambria after a very beautiful drive. The CA1 was closed about 10 miles north of Cambria. 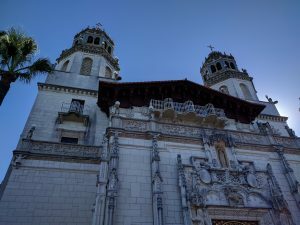 Of course, I had to make a stop at Hearst Castle. Since CA1 was closed just north of Cambria, getting out of Cambria actually required some backtracking. I took the CA1S toward 46E, which connected to 101N. I then had to take 101N until it reconnected with CA1. Luckily for me, this drive involved driving through some beautiful farmland. Getting stuck behind slow tractors was annoying, but the smell of ripe, in-season strawberries was probably my favorite part of the trip. After following 101N for a couple hours, it reconnected with the CA1. The Big Sur portion of CA1 is not to be missed, so I took CA1 south for 26 miles. 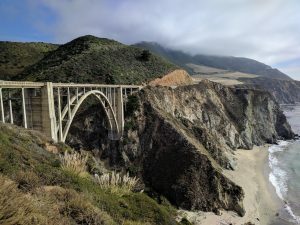 Along this route are beautiful ocean views, plenty of turnouts for pictures, and the famous Bixby Bridge. Of course, once I reached the end of the 26 mile stretch, I had to turn around.. but it was worth it. This stretch added about two hours to my journey, including stops. The final portion of my trip was driving up to Mountain View. It was getting late, so the sun was setting and traffic on CA1 was thinning. The ocean fog was rolling in, making for an even cooler drive. Along the way, I stopped at a lighthouse for pictures. Eventually, I reached 92E which signs indicated “San Mateo”. I took it and followed signs to Mountain View. I arrived at around 7PM. This entry was posted in Exploration and tagged ca1, road trip on May 20, 2018 by brandonio21.